The honeycomb construction of these soft, yet durable shades—available in single, double and triple honeycombs—make them highly energy efficient. Honeycomb shades get the name “honeycomb” due to their construction, which it designed like a honeycomb in a beehive. They are made of soft textured, woven and non-woven fabrics with crisp, even pleats. Many shades are available in single, double and triple honeycomb designs, a variety of pleat sizes which provide varying degrees of light control and privacy. They can fit almost any window, including specialty shapes and stack neatly with minimal space at the top of the window when raised. 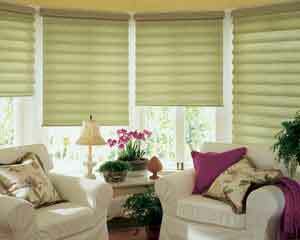 Most roman shades are simple, flat fabric shades that draw up in neat, even folds, giving them a tailored look. Some roman shades maintain their contoured folds while in the down position. They are available in various types of fabrics ranging from smooth semi-sheer polyesters to highly textured semi-opaque polyester/rayon blends and also in room darkening fabrics. 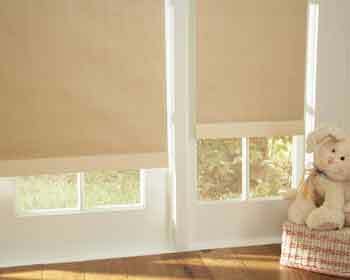 Sleek and sophisticated, Modern Roman Shades consistently present a clean, neat appearance. Woven wood shades are made up of bamboo, reeds, grasses and jutes adding warmth and dimension to a room. These shades hang flat in the lowered position and then have overlapped folds when raised. They are uniquely textured, adding casual good looks to any room. These shades are well suited in a casual setting, like a family room or den. In a contemporary or tropical influenced design, these shades work well in any room. These shades are made of all natural materials. Woven wood shades may have knots, slight surface cracks, variations in paint and stain, grain and pattern irregularities and slight distortions. These are considered normal and only enhance the beauty of the natural product. A vast improvement to the traditional roller shade, window shades come in hundreds of fabrics, colors and styles and you can order select fabrics separately for designing room accessories. The fabric on these shades can be made from durable polyester to high tech dyed screened fabrics with an array of opacity options.